Our famous biker gnome finally got his new black bike! This cool biker dude is ready to ride the open road on his shiny red motorcycle! This garden gnome statue is made from cast stone resin to resist all kinds of weather - he really is as rugged as he looks! 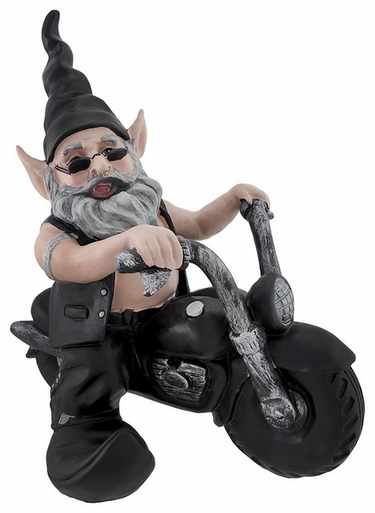 Check out the amazing fancy detail on this biker gnome! He is wearing a leather vest and chaps, black boots and even has his dark shades, not to mention his skull necklace, silver armband, silver chain to his wallet, with a Born to Ride on his back and the license plate to match! Complete your collection with the biker babe on her own bike too. Together this couple makes for mean garden attitude, and a fantastic biker gift.